This document explains how to install and configure software on a Windows computer to send all event log messages to a syslog server. Also, some information is provided on configuring a Linux host as a syslog client, and more as a syslog server using Red Hat Fedora Core 3. I wanted to collect more information from various Windows boxes that I manage, but I did not want to pay a lot of money, or manage licenses for another piece of software. I had been using 'syslog' to collect alerts and other messages on a central location for a while, so when I saw the free and open NTsyslog, I was very interested. I installed it (manually) a couple of times, and it worked well, but it really needed an installer to be of use to me (my Windows installations have few clients and are in unrelated businesses). When I discovered Inno Setup, I knew I could make a nice installer for NTsyslog that would have a Windows client up and reporting in a few clicks. Jason (the person responsible for NTsyslog, thank him very much) put the installer up on the NTsyslog sourceforge page. Configuring NTsyslog is pretty easy, especially if you have configured syslog on Linux or UNIX hosts before. 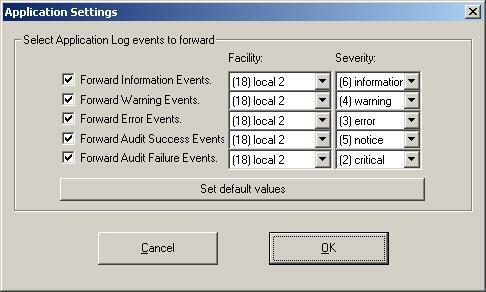 You can choose to report or not report via syslog for five types of events in each "EventLog". By default there are three EventLogs: Application, Security, and System. You can report for other EventLogs (in the current version), but you will have to edit the registry to do so. 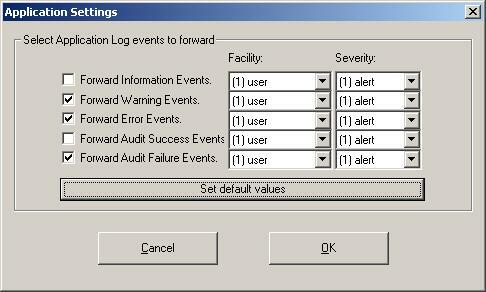 For the event types you decide to report via syslog (of Information, Warning, Error, Audit Success, and Audit Failure) you must choose a syslog facility and priority. 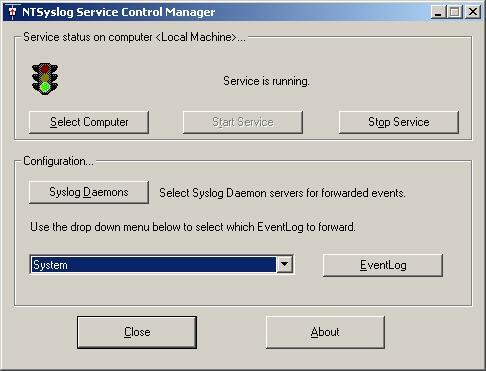 What you choose depends on how you wish to log those events in the syslogd server configuration. If you want to log Windows clients and servers separately (like I do), you will want to choose different facilities for those two types of Windows boxes. 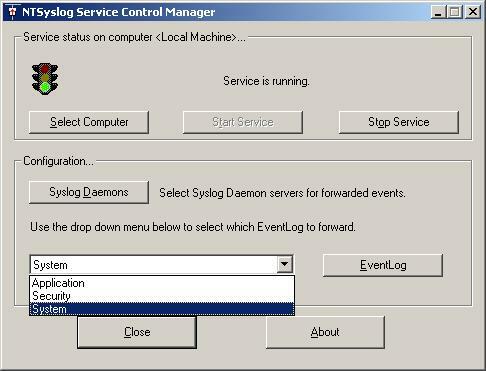 These are screen shots of the main window of the "NTSyslog Service Control Manager", the main window dropdown box with EventLog choices, the "Syslog Daemons" server settings dialog box, the default settings for the "Applications" EventLog, and my client settings for the "Applications" Eventlog. I have registry files for my current favorite setup for servers and clients, where "192.168.1.1" is the IP address of my Linux log server and "192.168.1.2" is the IP address of my secondary log server, or maybe a Windows box running a syslog server (like Kiwi Syslog). To easily replicate custom setups, I made a batch file to dump the current settings for editing or immediate use. You may insert multiple lines for different message "selectors" (the "*. *" and "*.info;mail.none;news.none;authpriv.none;cron.none" parts in the examples given), or for sending syslog messages to multiple hosts. Use "man syslog.conf" to find more possibilities for sending log messages from a Linux syslog client, and what the details of the above examples really mean. and I also edit one file and create another on my Red Hat-ish boxes. This is done so that the Windows logs are rotated on the same schedule as the others, requiring the syslog server to restart only one time. This example would allow only the host with the IP address of 192.168.1.10 to send syslog messages to this syslog server. If you want multiple single hosts, or multiple subnets, to be able to send syslog messages to the syslog server, just use multiple lines to express those rules before the "-j REJECT" line. IPTables has great power and flexibility, and more information concerning it is available from other sources. If you don't see any messages immediately, reboot a machine that is configured to report syslog messages (if it is convenient to do so). Most computers send many interesting syslog messages on bootup. I have been looking into ways of processing the logs, but I suspect there may be a few I don't know about. One option is logwatch, which comes standard on Fedora Core 3 and on many other Linux distributions. Another is epylog, a log processor implemented in Python. Still another interesting option is Sawmill, and while it isn't free, but it might make your current logs a lot more valuable to you, so may be worth the money (and they have full working versions for evaluation purposes). Lastly, I tried out Splunk recently and found it worth getting to know better, and it comes in free and paid versions. Though I am mainly interested in email alerts and web reports, I do try to keep an open mind. Please let me know if one log reporting or alerting package or another works great for you. The '$' characters are shell prompts. Most commands listed will have to be accomplished as the 'root' user.